This woodblock print is a book illustration and appears in the middle of column of text. The chapter is entitled “The Rites and Sacrifices of these Indians, and how these great butchers eat of human flesh.” Like many European authors of the time, Pedro Cieza de León emphasized the practice of ritual cannibalism, and attributed it to the work of the devil in the New World. In this imaginary rendering by a European artist, a statue of the devil is set on a column, depicted in conventional European fashion: with bat-like wings, clawed hands and feet, a long tail, and horns growing from its head. The Corinthian column that supports him may refer to the pagan past of antiquity. In the 15th and 16th centuries, artists often used elements from ancient Greek and Roman art and architecture to depict pre-Christian settings and history. 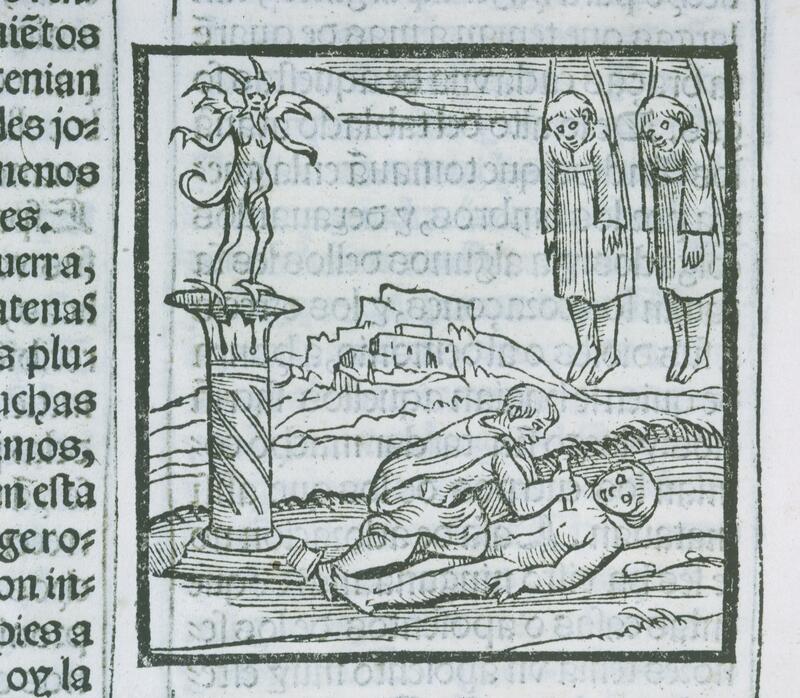 In the foreground, the artist pictures the Andean “butcher” (likely an indigenous priest) as an agent of the devil and has imagined the sacrificial victims hung like sides of beef, ready to be butchered. Pedro Cieza de León, a Spanish adventurer-turned-historian who spent fifteen years in Peru and witnessed the dismantling of the Inka empire, wrote this book. The print was created by a European artist employed to illustrate the text. This printed image is a woodcut (also known as a woodblock print), made by pressing paper against a carved block of inked wood. Its carver would have cut away the background of the wood block, leaving raised lines to carry the ink. Cut of hardwoods like apple, pear, or boxwood, woodblocks were fairly durable, but lacked the fine detail that was possible through other print-making processes, such as etching. Images like this fueled stereotypes about the New World and its peoples, casting indigenous priests in the role of the devil’s henchmen, and flattening distinctions in religious practice from region to region. 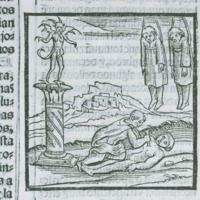 (For example, Andean sacrifice seems to have been much more limited than Aztec.) But they also represent genuine attempts among Europeans to understand foreign belief systems in terms of their own beliefs. How else could such a practice, along with the highly developed ritual systems and deep-rooted beliefs among peoples in the New World, be explained? In the case of Cieza de León, respect for the Inkas not only horror at their devil-inspired ways, surfaced in his Chronicle. Works such as Cieza de León’s and the imagery created for it played important roles among European readers of the 16th century (and later), spreading the idea that peoples of the Americas were indeed demonic worshippers thus in need of both conquest and conversion. Today, historians still seek compelling explanations for pre-Hispanic beliefs about the Otherworld. For contemporary scholars of religion, however, anxieties about demonic intervention have given way to questions about human spirituality and the specific colonial practices that rendered Andean beliefs so frightening (yet also fascinating) to European readers of the 16th and 17th centuries.